Browse content similar to Series 12 (Reversions). Check below for episodes and series from the same categories and more! Christina Trevanion and Thomas Plant set off from Cashel, County Tipperary. Christina Trevanion and Thomas Plant continue their adventure in a 1962 Bedford van. It is the final leg of the road trip for Christina Trevanion and Thomas Plant. It's the second leg of the road trip for Charles Hanson and Margie Cooper. Charles Hanson and Margie Cooper clock up more miles in the temperamental 1969 Elva. Charlie Ross and James Braxton kick off a new adventure in a 1961 Ford Zephyr. Charlie Ross and James Braxton set off from Shenton, Leicestershire. It is the final leg of the road trip for auctioneers Charlie Ross and James Braxton. Catherine Southon and Paul Laidlaw travel from Aghadowey to Edinburgh. Catherine Southon and Paul Laidlaw travel from Perthshire and Angus to Stirlingshire. 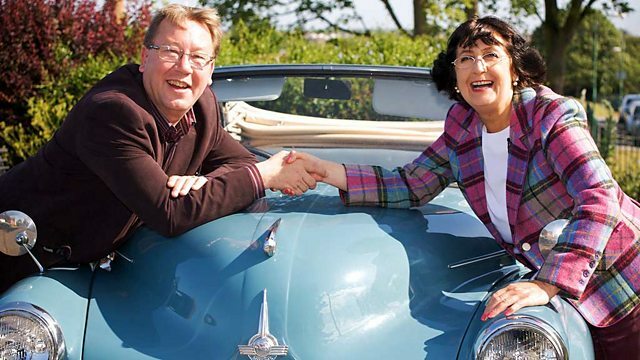 A new road trip begins for auctioneers Anita Manning and Philip Serrell. Anita Manning gambles all her budget - but will her canny buys pay off? It is the final leg for Anita Manning and Phil Serrell. Who will be champion of this trip? Mark Stacey skips over to Rochester Castle and Thomas Plant pops into Chelmsford. With only a few pounds separating our duelling duo, the pressure is on.